This is a solo album by Inoue Kikuko. All songs and lyrics written by Inoue Kikuko. 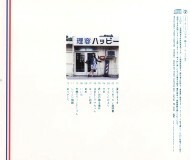 This is Kikuko's third album where she wrote all the songs and lyrics.